Ever tried to put a square peg in a round hole? While you could adapt a square peg to fit the round hole it will never be as perfect as using a precise and custom fit round peg. The same rule applies when considering specialist vehicle manufacturing. While off-the-shelf components can be made to fit with some adaptations, custom-made components will always be more suitable. Being able to steer and control any vehicle is clearly a vital feature. However, many assume that one steering column is pretty much equal to the next one. Nevertheless, when you’re designing a commercial or military vehicle, or even a four-wheel drive off-road vehicle, the requirements for your steering systems are much more complex than those of generic passenger vehicles. Specialised vehicles must be able to cope with challenging performance and environmental challenges while maintaining reliability and safety standards. Being able to place an order and receive it in a few working days may be appealing, but the off-the-shelf product you’ve chosen may actually not truly be fit for your purpose. For example, parts used when constructing a luxury passenger coach could also be used for a road sweeper, or even a military vehicle used in a variety of environments and conditions. However, the needs of a passenger coach travelling up and down the UK’s motorways are completely different to the needs of a military vehicle in combat. For manufacturers of specialist vehicles intended for use in a range of extreme environments, designing individual components of the steering system is vital for optimum and reliable performance. By working with custom parts specialists, vehicle manufacturers can work directly with design engineers to customise elements like steering columns, bevel boxes and suspension joints to ensure the parts are tailored to withstand the relevant conditions. The key benefit of opting for bespoke vehicle elements is the complete flexibility in design. Bespoke products provide components that suit your exact requirements and working with a company that has experienced design engineers on hand to design and test components can be a game changer. Pailton Engineering’s design engineering team have the knowledge and experience to be able to design intricate steering components and systems that can perform in any situation. These components can then be tested under industry specific conditions to validate that they meet design requirements. Additionally, in the fast-paced vehicle sector, design capabilities, technology and products are constantly advancing so you can’t afford to be left behind. As time really is an important factor, vehicle original equipment manufacturers (OEMs) should work with a component manufacturer that can offer comprehensive prototype and testing programmes. For example, at Pailton Engineering we can simulate 500,000 miles of driving in just ten days. This means that your steering system or component is tested to realistic conditions in next to no time. However, it is important for vehicle manufactures to appreciate that in order to design and test a custom fit part or system, thinking about such components cannot be left to the last minute. By engaging with a design specialist from the outset, you can develop innovative and bespoke components that meet your manufacturing schedules and unique requirements. This also allows you to discover new possibilities that you may not have previously considered that can take your vehicle design to the next level. 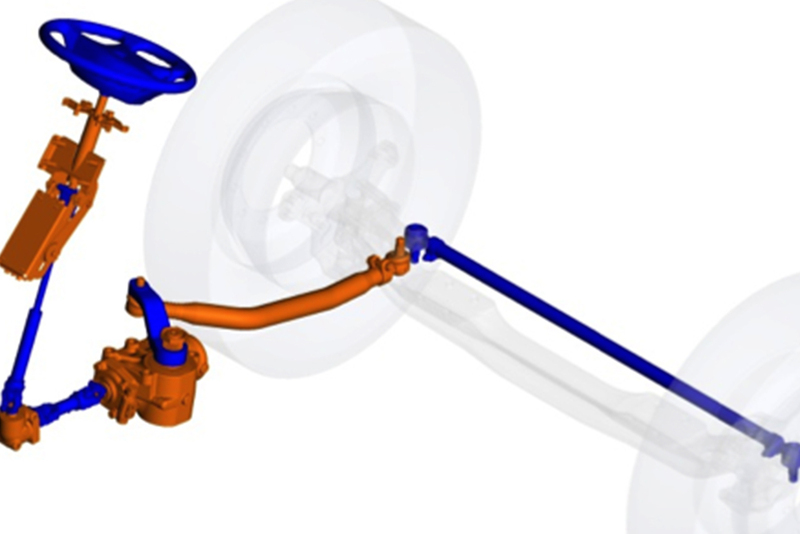 Designing and manufacturing steering systems for specialist vehicles shouldn’t be a case of placing an off the shelf product straight into your system layout. That’s just like hoping a square peg will somehow fit in a non-square hole without making a mess. Luckily, with a design engineering team on hand, you can have your steering components made to fit precisely. Round peg, round hole — a perfect fit. Nick Jordan is technical manager at steering system specialists Pailton Engineering.